One of my favorite shows, “Rome,” is ending. Apparently, it was costing too much — even though the BBC was footing part of the bill. It’s cancellation is unfortunate, but to history nuts like me it’s as good a place as any to end the show. 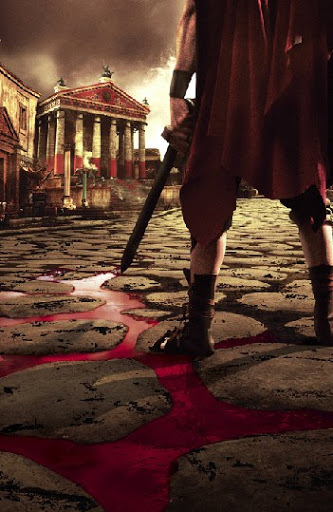 The first season chronicled the rise of Julius Caesar as dictator of Rome and ended with his assassination. Apparently, the second season is chronicling the rise of Octavian, Caesar’s adopted heir who became known to history as the first Caesar Augustus. It appears the show will end with his defeat of Mark Antony — which it seems we’ll see this Sunday when the finale airs. At least it’s a logical place to close out — the true founding of the Roman Empire and the beginning of the Pax Romana. Obviously I haven’t been posting for a while… After the recent move to the new place, there was no Internet. The only place I could really connect was at work. Time Warner is finally arriving tomorrow morning! If all goes well I’ll be boring you on a regular basis again by this weekend. Things I’m going to realize on my death bed… and some things I already know. All in all, taking everything into account, I haven’t been a good person. Or, when the karmic jury tries to decide if I did more good than ill, they’ll merely deadlock. More often than not, I made the wrong choice. Many good things happened to me, most of them by chance or accident. Many bad things happened to me, most of them as a result of my own stupidity. The two words that best describe me are “lazy” and “narcissistic.” I can’t think of any faults harder to overcome. Realizing that I was lazy and narcissistic didn’t help me stop being that way. Although, in my defense, I will say that as I got older I was able to fake not looking quite so narcissistic. I wasn’t able to fake not being lazy however. I was only faking when I got it right. I wasn’t nearly as smart or talented as my ego told me I was, and not as dumb and untalented as my lack of self esteem told me I was. My lack of self esteem is fraudulent. The problem is that I love myself too much, and when I don’t live up to my perceived perfection, I’m angry at my narcissistic self. I won’t have Internet connectivity at home for another week or more. Right now I can only get online at work or if I carry my trusty laptop down to Starbucks. I’m roughing it in the new place, living like the pioneers… That’s right, no dishwasher, no air conditioning, no patio. How oh how did those pioneers survive in the olden days? But DirecTV comes today. I can’t decide which is harder to live without, DirecTV or Internet? No matter how much you plan, no matter how much time you give yourself to get ready, every move is an ugly one. You can start planning a month early, cataloging all your belongings, measuring, marking, planning exactly how many boxes you’ll need and how to pack each one perfectly, labeled without error and ready to move into the exact right room in the new place. But without fail you’re up late the night before tossing items into the nearest box without rhyme or reason… Hey, there goes the dog! The cat! The fine china! And no matter how much time you give yourself to box up everything, you’re still tossing things into boxes as the movers come through the door. And by the time the movers have taken all the boxes out and start on the furniture, you notice another ton of stuff not packed, necessitating endless car trips back and forth finishing up. And don’t even get me started on the new place. The gas hadn’t been turned on, so the place was too cold to sleep in. Off we went to a hotel. The fridge doesn’t work, so all our food is ruined. The bathroom door wouldn’t close — mainly because they hadn’t finished hanging it properly or installing the latch in the jamb. The kitchen faucet doesn’t work. The aggravating thing about all this is the place is nice… It would be nice to be able to enjoy it. Hopefully soon. Cecil the cat doesn’t like it. Orson the dog doesn’t know what to make of it yet, except that it represents whole new vistas on which to pee. In the meantime, I won’t have Internet connectivity at home for another couple of weeks or so. I can log on from work or head down to the Starbucks on the corner and use the wi-fi. And no DirecTV for another week. That means missing Olbermann, Daily Show, Colbert, Earl, 30 Rock, Lost, Rome, Battlestar… How oh how did people live during the Stone Age without satellite and Internet, without TiVo and laptops?